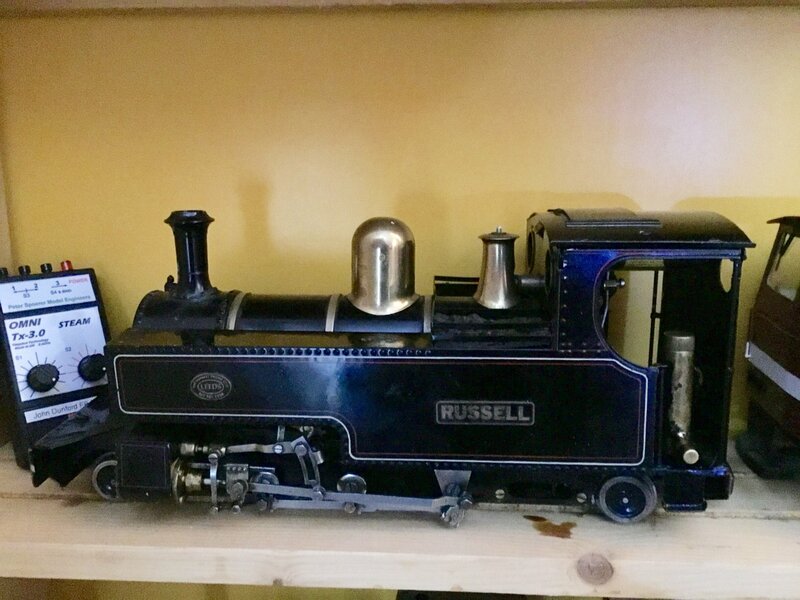 Just recently I have been worrying about my Russell that has not been capable of running for year or two now. It would be rather nice to use it for the Christmas Day Milk Train this year. In point of fact the last Time I recall running with any degree of usefulness was at the Ruscbahn in 2013, though I may have had a run or two on my current line since then. Memory what a problem? Now I consider myself to be a reasonable dab hand with Live Steam, not in Tag’s league but with a mediocre level of incompetence. So Russell has been a problem, not being able to supply Steam to the Cylinders, thus just not running at all. I think I asked Roundhouse about it at Warley Show some 4 years ago. Hmm needs to be sorted. So off came the Body and I started to faff around. To be honest the only thing that I found amiss was the Wire from the Servo to the Regulator that was not allowing full movement and thus opening of the Regulator. In the past the Regulator was a little reluctant to close thus stopping required a little bit of Reverce Gear. So after some adjustments and testing with the RC to see if the Regulator was now working all appeared fine. Oh I also forgot to mention that somehow I had inadvertently flogged the Planet RC Unit! So I had a Fosworks Setup in stock and he is now sporting a Fosworks OMNI TX 3-0, now standard on my 3 Roundhouse Live Steam Loks..
Jack was painted up by Geoff Monday in 2006, has a Chuffer Pipe and I collected it from a guy in Nottingham after a winning EBAY bid at around £1200. Now that he is running again this seams to be a pretty good deal. Pic on the shelf this morning. And a short Vid of him Running the other day after the fix. As can be seen a common trait with Live Steam, slow steady running is a little tricky. Even harder when trying to drive a Camera while doing a Vid. Thus Russell is slated to be fitted up with a SloMo at the earliest opportunity. I am assuming this should be possible as PPS does one now for the Lady Ann. But as with my old Jack the Weight Bar is a Pin Fitted Curves one that makes fitting a SloMo less than the easiest of Jobs. But it must be done. Jon, when was the last time you had a thorough boiler cleanout? And I MEAN thorough, with a good descaler that is brought up to the boil and then emptied out after ten minutes - once or twice or even more. Your old loco might just be getting a touch of asthma brought on by reduced volume of piping and a furry lining to the boiler, even using the very best of rainwater. I cook up a boiler-full of the cheapest vinegar I can find in every one of my boilers - once a year - even though I have a laboratory-grade distiller to provide glurn-free water for me. Tac, that sound like good advise, would it be possible for you to elaborate on the exact procedure that you use? For example, is it ordinary brown vinegar, or white, ? How long do you leave it in the engine? Do you flush it out afterwards? Any more details would be greatly received by many of us with steamers, my Roundhouse Lady Anne is about 18 years old and still goes ok but may benefit from some attention. Never, I am unsure about that process and would like some further advice from other 16milers that I know. It is fairly normal to Pickle Recently Silver Soldered Boilers and fittings with a mild substance such as Vinegar. Though I am not sure about cooking the vinegar in the Boiler, though I can see that would get to every part. It is just the cleanup and getting Oil cleanly into the cylinders after. It is also a worry with some Locomotives that may have Viton O rings in varying places as I am unsure what the Vinegar would do to them. Jury is out for Judgement at the moment. The vintage of the vinegar is immaterial - cheapest is best, unless you want to re-use it on your chips afterwards. Pour it in, fire it up to get it good and hot, swish it round a few times, and then pour it out. Sure, flush it out a couple of times. It's not rocket science. And it doesn't go anywhere near your pistons. I've been doing it for thirty-forty years. My locos work as advertised. Apart from the boiler clean out which I would recommend it seems to perform ok, the only problem I can see is that it is light on it's feet. they all have their foibles. 'zackly. You may have noticed that in one of the Roundhouse Open Day movies on YT that what looks like a Lady Ann(e] is hauling a 20-something pound load around the test track. Sure, being an 0-6-0 is all traction, but I've not seen a RH loco that didn't pull like a, uh, train. Perhaps, for Dunnyrail, an adjustment to the springing of the truck might lead to better performance. As he suggests, fitting a Slo-Mo device might do the trick. Certainly, Chris Bird's locos seem to benefit from the fitting thereof. That spiral is on a 1:40 Grade and a 1:30 bit at the end so the performance is fine with that load of 20 Axles all Metal Wheels. Certainly a RH Loco other than an 0-4-0 will never have the same performance, my now sold Fowler 0-6-2 with great lumpy Bogie Tender had nothing like the grunt of my Jack or Stanley Steam Tram. As for extra weight, Russell has a couple of socking great lumps of Metal screwed onto the cosmetic Sude Tanks already. A SloMo as Tac says will certainly improve the pulling performance as controlled slower running will always help prevent slipping. The video shows the safety valve venting almost continuously. What pressure is shown on the gauge when the safety valve *starts* to lift? I guess he needs the constant level of blow-off to make sure of having enough pough for those grades. They seem pretty stiff to me, and I'd only use that kind of grade with a geared loco. 40 PSI. RH Loco’s are notoriously tricky to keep at a non-blow off rate as the Gas gets warmer during running effectively meaning that regular adjustment to the Burner Valve is necessary, somewhat tricky whilst trying to film! I have known some guys convert the Gas Regulator to be Operated from a Servo thus making adjustments during running somewhat easier. Hmm well I guess you can imagine my ideas about that. As for the Gradient, it is on the Continuous (not used that often) run and the 1:30 was a foul up, the 1:40 not much choice in a modest sized Garden to get the loop in so that Trains can turn over where they have just come from with adequate clearance. Horses for courses, the Gradients do though make the Locomotives work as the Chuff Pipe demonstrates and to be honest I would not have a Train much larger than that shown as it would be an issue at some of my Stations. Out of interest does the loco have all wheels flanged or is it like most RH 0-6-0 loco's the centre wheels unflanged, this being the case this might affect the adhesion of the loco especially if the wheels are unsprung. You say that it already has weights fitted do you know what material they are? might be an idea to replace them with lead, or add some more between the frames it might gain a bit more adhesion. Nowt wrong with that then. Perhaps I'm being dense, but when you say "not being able to supply Steam to the Cylinders" do you mean that, in that the loco stalls, or do you mean it slips? If the former, I'd remove the chuff pipe (creates unnecessary back pressure in my view, although others disagree), disconnect the regulator r/c and run it in "manual" mode. It could be the regulator is not opening far enough (wrong type of regulator maybe?) due to restriction by the servo link. If the latter, add weight or reduce the load! The Regulator was I thought originally opening but no steam getting to the cylinders. Thus not moving at all. As I said I think that the Regulator was just not opening at all with perhaps the Wire from the servo just bending. I think originally I may have been just not taking notice of what was or not was going on. Only when I was further looking at it last week with diligence did I think that the Regulator was not being opened properly. Thus leading to a fix. As for the Chuff Pipe causing back pressure to effect running, this is not the case in my view. All 3 of my RH Locomotives have them the only issue was occasional tricky lighting up on my Jack which was resolved when the Chuffer was remounted some months back. Thus leading to a fix. As for the Chuff Pipe causing back pressure to effect running, this is not the case in my view. As I said, it was just my view from years of fitting them and seeing what they do. Further to Tac’s comments about cleaning Boilers with Vinegar. On Saturday I managed to chat to one of the Roundhouse team who said that the suggestion was sound and that it should not damage any of the O Rings. Suggesting making sure that all was well flushed with clean water after, this would of course mean a water that is not in any way Hard. However he was non commit all about brewing up the Vinegar in the Boiler.